I don’t like Halloween. Never have. Never will. Not for of any particular religious reasons, but simply because it always seemed a pretty pointless exercise to me. Until I moved to live in Spain. Although the American-style “ghosts and ghouls” type of Halloween has now started to creep into the Spanish calendar each year, this time of year is celebrated here in a different form, as “El Día de los Muertos” or the “Day of the Dead”. The festival of Todos los Santos (All Saints´ day) is a national holiday on November 1st each year, when cemeteries are packed with families paying homage to their dead and tending the gravestones of their ancestors by placing fresh flowers and candles. This is a commemoration for loved ones with nothing ghoulish or scary involved and, thankfully, without commercialism. How do you honour loved ones who have passed away, in your part of the world? This entry was tagged Andalucía, Cómpeta, culture, customs, Day of the Dead, East of Malaga, El Dia de los Muertos, Europe, fiestas, flowers, life, Malaga, photography, Religion, Spain, travel. Bookmark the permalink. halloween is an opportunity to dress as someone you are not. It can be fun and carefree. Los dias is an opportunity to commemorate those we loved who hav died. They both are different and have their place. I learned about the Day of the Dead initially from Barbara Kingsolver’s Animal Dreams, and although many cemeteries in Australia are well tended our culture doesn’t have that immediate engagement of others. Haven’t read that book, EllaDee – I’ll have to put it on my (very long) list! Thanks. Clever make-up, but more for a theatre production! Another viewpoint – YAY! Exactly why we blog Marianne!!! Bravo! You’ve hit the nail on the head, Kathryn. I was just saying to a previous commenter (Eduardo) that it’s good that we all like different things. How boring would it be if we all liked or wanted exactly the same? I LOVE your blog and the longing and ecstasy it affords me. I hate Halloween. I am very sad to see that it has spread into Spain. I can’t believe that as a kid, I participated in the parties. I also dislike Day of the Dead or Dia de los Santos celebrations. I’m very sad that Halloween has spread to Spain too, Eduardo. What a wonderful way to honour and revere those loved ones who’ve passed on, Marianne. I think every country should have this national day. 🙂 Glad it arrived safely …. I always wonder! Your penultimate one is on the way from Porto, Portugal – where we were last week. I don’t like Halloween either. It’s way too commercialized and I’ve never enjoyed being frightened. I walked the Camino de Santiago this year in honor of my father, who was a Lover of Spain and always told us that it was the “Madre Patria”. I’m glad I did as I thought of him a lot while walking and it’s nice to remember. What a lovely way to remember your father. I can well imagine that you thought of him a lot during your walk. I’ve heard tales of many people who have completed The Way saying it has changed their lives. The Camino was all that I expected and more! It was a dream of mine come true. I walked 790 kilometers (500 miles) in 35 days of actual walking. I spent and additional 5 days resting or recovering from injuries. I met and walked with people from all over the world and was invited to Vigo at the end by Spanish friends for a week on their beautiful beaches. I’ll also be visiting friends in Melbourne next Spring! I highly recommend it because you will see great beauty in the countryside and the people you meet. Fantastic, Michael – well done. What an achievement! They do pretty much the same thing here except not at Hallowe’en – it’s in summer. Families go to the graves of loved ones, tidy them up, place flowers, have a picnic, sing, dance etc. Hallowe’en isn’t big here at all – although I have seen a few tots with face paint so I give it another 5 years or so! I agree with you to – I loathe the idea of Halloween. Am in the UK right now and (stupidly) answered a ring at the door a few minutes ago only to find three young people in horrible masks screaming at me. I don’t know them, they don’t know me – bascially they’re asking a complete stranger (from the safety of their own home) to give them money or sweets or they’ll carry on trying to frighten me. What’s that all about then? I much prefer the idea of All Saints and All Souls – El Dia de los Santos y El Dia de los Difuntos and paying our respects to those loved and lost. I’ve never understood it either, Tanya. I feel sorry for old people, living on their own who might be fearful to either answer the door or of reprisals if they don’t (or can’t) hand over money or sweets. Another American here. Totally get your post. While I haven’t gotten excited over Halloween since I was a kid and don’t have a strong anti-Halloween spirit, very few get the fact that the holiday is the eve of All Saint’s Day. I love the idea of putting fresh flowers out in memory of those we love. Thanks for the post. Thanks for your comment, Ramona. You’re right, of course – most people don’t understand the significance of the date – besides, it’s been hijacked these days. Just prefer how it is celebrated here, though I guess within 20 years it will be just the same in Spain, too. 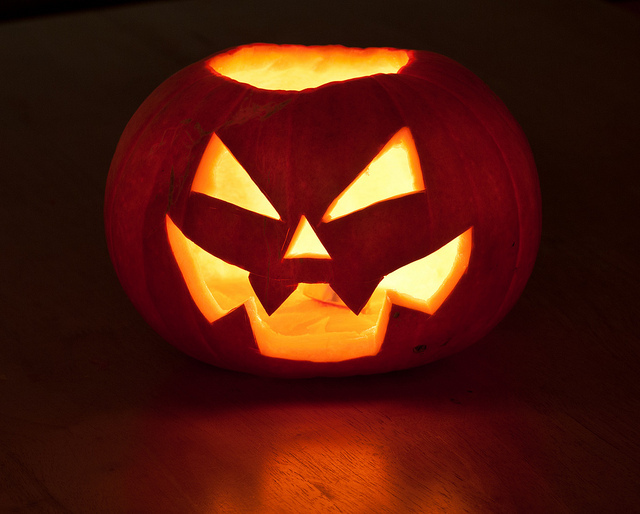 When I was young, I don’t ever remember celebrating Halloween – certainly not in my hometown of Brighton & Hove – maybe it was different in small towns and villages of the UK. Later, however, (not sure whether it was the 70s or 80s) yet another insidious American custom was imported from across the Atlantic which was (a) an excuse for shops to make more money by selling Halloween related items and (b) for spoiled children to have an excuse to bother their local neighbourhood with “Trick or Treat” and to carry out some act of vandalism if any householder was foolish enough to not give them money. In principle, Spain’s ‘Day of the Dead’ followed by ‘All Saints’ Day’ is a much more relevant celebration, where the idea is to commemorate ‘loved-ones’ who have passed away. However, commercialism here seems just as rampant as in the UK and, during the last couple of years, some neighbours have suffered minor vandalism with raw eggs splattered on their windows. Absolutely RIGHT, Gemma. Honour them on Earth, first! I’m with you on detesting mass commercialism of festivals or ‘occasion days’ aargh! In fact, I make a point of NOT joining in with it, and making these days as simple as possible. Don´t have much time to sew lately. I thought you´d like to know how we celebrate All Saints Day here in Spain. I had a baby to commemorate my father’s death. My darling girl was born on the 28th anniversary of my father’s death, also the day of the dead. and I just learned that he died on a Monday….and she was born on a Monday!! weird huh? okay obviously this is an isolated case of commemorating loved ones who have passed on….but tomorrow is a big day in my life! always has been, always will be. Wow! What a great way to remember your father! I love these cemeteries Marianne, and that’s a great photo. The Tossa de Mar cemetery is a lovely peaceful haven, and right next to the busy bus station, but hardly anyone seems to go there except for families looking after their loved ones. I’ve spent many an hour just sitting in there. I just love cemeteries, Elaine. Always try to visit them wherever we are – and I agree, there’s hardly anyone else there whenever I go. 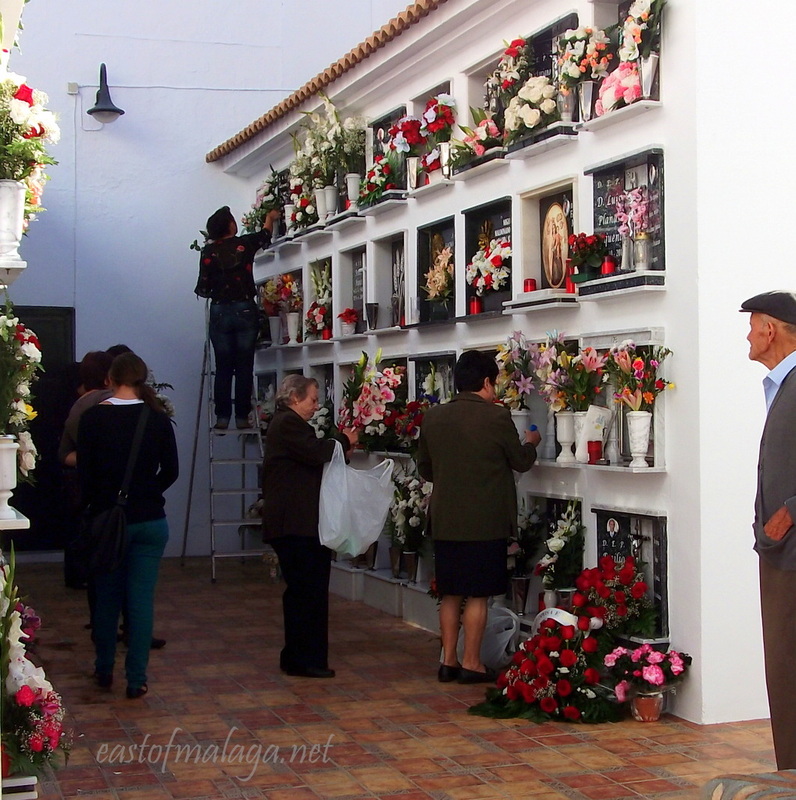 There’s a great cemetery in Malaga known as The English Cemetery – have you been? Where I come from, we also congregate round the graves, but it’s a more sombre affair. People often go out into the woods the day before to collect moss, which is used to decorate the graves, creating a green, velvety “carpet”. Flowers (e.g. white and read carnations) are laid on top. i agree entirely with el dla del los meurtos. where i live we have cemetry mass at a warmer time of the year to remember our dead.we can also go to church on all saints day. unfortunately this period is now driven commercially and is losing its spiritual significance. I detest the mass commercialism most festivals now attract (including Christmas, Easter, Halloween etc). Fortunately, living rather isolated in the countryside, we have never had any trick-or-treaters knocking on our front door! I hate the commercialism too…. It’s different in the US though, Cat. You grew up with it, so you’re bound to miss it. It’s such a big thing there, isn’t it? I guess Todos los Santos is a big thing here, too – but in a much more respectful and refined way.